Well, this Monday night gig was rather a different JY show in many ways. Though set in what seems to have become the 'home town gig' for John, despite being a dozen miles from where he lives, it wasn't in the normal venue. Instead of playing between to Ladies and Gents toilets of The Star (it isn't as bad as it sounds, honest) tonight he was playing through the burger smoke atmosphere of an L-shaped marquee. The change of venue (and day - normally Friday night is gig night at The Star) is because of Her Majesty the Queens Golden Jubilee. With the following day also being a public holiday people could let their hair down and quaff plenty of liquid refreshment if the need took them. 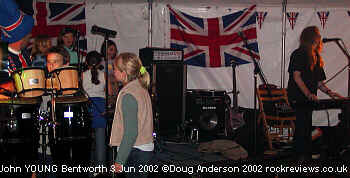 Situated a few hundred yards downhill from The Star the marquee was erected in the grounds of the local school. Having taken a detour via Botley to deliver a borrowed bag we arrived rather earlier than expected at 7.30, the 'doors' not opening until 8. After a few minutes sat in the car we decided to stretch our legs and found the event already open and a number of tables being occupied. Paying out £5 entry to a familiar figure in an unfamiliar guise (and already well on the way to liquid oblivion) of Union Jack everything (shorts, T-shirt, 'top' hat and even glasses) we entered, grabbed a drink and found a table nicely in front of the stage centre. The music kicked off a little after eight while the air still showed the chill of condensed breath. First band onstage was a trio of gangly local youths with a Nirvana fixation. They played a self penned number early in the set but the lack of stage experience and similarity of all the music they played, even classics like 'Wild Thing', soon lost my attention. All credit to them for getting up to play though but I feel a little more interaction with the crowd, even if just to give titles to more than one of the songs, would have helped. They played for over thirty minutes, the time John had been allotted. As the bands changed over the compare for the evening, ?? ?, a friend of Matts from Worcester, entertained with a couple of solo numbers. Another thirty minute or set followed from an older and larger band that both rocked and folked though still the vocals were lost in the mix and the underpowered PA pumping through meagre speakers. They played through the expected start time of the JY set and finished around nine thirty. So, quarter an hour later than expected John set up his equipment at the compare played two or three more tunes, this time with some percussion backing care of our merry host, Matt, who almost toppled the drumkit as he left the stage. Around quarter to ten our man was introduced after what I assume was a local bigwig telling us that the bonfire was to be lit promptly at ten p.m. Not much time for even a cut down set for John then. With no soundcheck any sound problems were going to have to be compensated for during the performance or lived with. After some final checks of the equipment it was off with the body warmer jacket and into the title track of the forthcoming CD, SIGNIFICANCE. 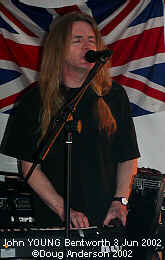 Initially John sang along to the backing before playing along on his trusty Korg 01/Wpro keyboard. Additional playing of the congas was care of Matt, not necessarily in always time though he did his best. It is certainly the closest I've seen John to performing his solo material with a live band. (There is still promise of this happening later in the year though.) The sound, though not great, was at least clear enough to make out the thought provoking lyrics . "As you can see we're having a few problems keyboard wise so I think I might do something on keyboards" clarified John before disappearing off to the back of the two inch stage to see if the PA/mix can be adjusted. Meantime Matt arranged a larger backing band for John - half a dozen of the local kids! As they fought over who would sit on the drum stool the John launched into PADDYDOG, his normal, though rarely played at solo shows, rocking keyboard improvisational piece. Well, it was not a solo tonight as the girls behind him played the drums with brushes and clapped along, all directed by their musical director, Matt. Thankfully they were a little subtler than their mentor. With time rapidly running out the rhythmic backing to JUST ONE DAY cut in as the percussion backing band left the stage. 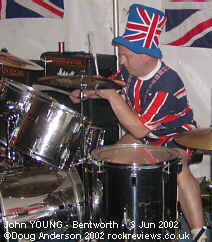 In their place came the following bands drummer to sort out the mess Matt and the kids had left. As the final notes faded ending the unlucky for some thirteen minute set fractionally after ten John thanked everybody for listening and added "enjoy the bonfire" The audience were already leaving for the spectacle of the bonfire/beacon and fireworks display and as the compare thanked him for the short set. As John and I loaded his equipment into the van our way was lit by a multicoloured lighting rig far brighter than the three lights onstage. Tonight was never going to be a great evening for aficionados of JY music but it promised a lot in the form of a fresh audience that would otherwise not have been exposed to his music. Unfortunately the delay and poor PA gave only half a short set over a less than perfect sound system and with the general audience more interested in their hampers or the bonfire and fireworks most of the melody and lyrics probably passed them by. A shame really but for Tracy and myself it was still a reasonably pleasant way to spend the jubilee celebrations. This page is Copyright © Doug Anderson 2000 - 2002. Created: 4 June, 2002. Last updated: 5 June, 2002.